Tune into our Siemens Science Day Ultimate Cool School Assembly as Patti Duncan presents fun and interactive science activities and highlights the importance of science literacy. During this webcast, students will be amazed as they witness interactive demonstrations and mind-blowing experiments while making connections to science class. The Ultimate Cool School Assembly is a prize awarded to the winner of the Siemens Science Day Ultimate Cool School Sweepstakes. 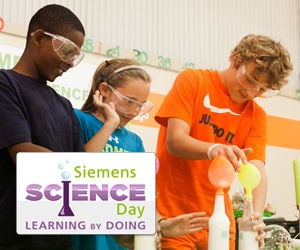 Learn about the sweepstakes and find hands-on activities to engage your students in science concepts at SiemensScienceDay.com. Have you visited the Siemens STEM Academy site today? Visit the Siemens STEM Academy site today to find the calendar of upcoming virtual field trips, blogs, professional development opportunities and other STEM resources.